Designated in the Gospel as “the disciple whom Jesus loved,” St. John appears therein as the model of devotion to the Sacred Heart. Faithful to the end, he clung to that Heart till he saw it stilled and pierced in death. Afterwards, he is manifested as the model of devotion to the Immaculate Heart of Mary. Pure as an angel himself, he took the place which Jesus himself had filled, and he continued to render her the love of a son till she too died. But our Lord’s third word from the cross contained more than a filial provision for his Blessed Mother. In St. John, our Lord pointed out the human race, but above all those who would by faith attach themselves to him. Thus was proclaimed Mary’s motherhood of men — the many brethren of whom Christ himself was the firstborn. 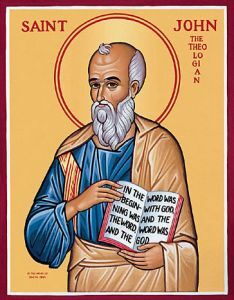 St. John was the representative of all these new children, the first to enter upon the inheritance, a model to all who were to come after him, and a saint to whom the Legion owes tenderest devotion. He loved the Church and every soul in it, and spent every faculty in its service. He was apostle, evangelist, and had the merit of martyr. He was Mary’s priest: therefore, a special patron to the legionary priest in his service of the organisation which aims to be a living copy of Mary. Zijn feest vindt plaats op 27 december.